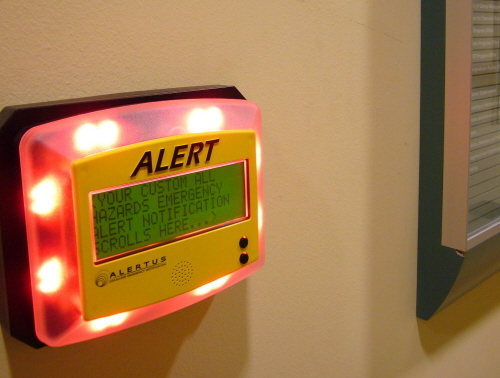 An Alertus emergency beacon is shown on a wall in this file photo courtesy of the manufacturer. MU has installed 245 Alertus beacons in campus buildings. If you hear a 10-second siren and see a strobe light Monday morning, don’t be alarmed. Since last summer, MU’s Division of Information Technology has been installing 245 Alertus emergency beacons in some of the classroom buildings. The beacons have been installed in 100-seat or more lecture halls and adjacent hallways and in gathering areas. The beacons are part of MU’s emergency notification system, which also includes alerts by text, Twitter, Facebook and mass email. When activated, the beacons light up, sound a siren and display a message from MU Emergency Management or, in the case of a tornado warning, the National Weather Service. All messages direct people to go to mualert.missouri.edu. The test is at 9 a.m. Monday. Manufactured by Alertus in Beltsville, Md., the beacons offer an alert in locations where emails, cell phones and landline telephones aren’t always accessible in buildings. Reception for cell phones can be spotty, and instructors often ask students to silence their phones during classes; staff and faculty many times turn their cell phones off during the day. “[The beacons] are one of the many ways MU alerts students, faculty, staff and visitors of an emergency situation,” said Karlan Seville, Campus Facilities communication manager. Two tests will happen Monday, one with a siren and one without.